So, I mention crochet fashion tip in the title, and I will explain why. I wouldn’t consider this stitch to be much more than a tedious stitch to work, that looks pretty cute when it’s finished! Other than small areas of a project, such as little accent areas or small trim… let me repeat… small trim, this stitch could not hold my attention for too long, it is, a bit annoying. I personally think that the twisted column, is one of those stitches, that after you’ve finished row 2 of your king size afghan, you are finally able to work it in your sleep at light speed! if, of course, you could handle it for that long. So, after I figured out how to make this from the pattern, I did a little search on YouTube to see if I had it all wrong, and, I was only able to find a lady, working this (in another language), only she was working this with a needle alongside her hook, pulling the yarn from the bottom up. It didn’t even remotely resemble the written tutorial that I had worked from, other than her ch 3 to start and 10 loops around the hook, so as I post this, I hope that I even got this stitch right! If someone is reading this and is familiar with this stitch, you are welcome to chime in! Sure, I might be a little embarrassed for not looking more into this and just hopping on the bandwagon to get my little tutorial out on it.. I’ve been known to put the cart before the horse, so now that it is all out there, you know, that this is my interpretation of a written pattern in a different language. I am going to go ahead and post the link here if you prefer to look at the directions yourself for possibly, your own interpretation. If you have no interest in interpreting or translating, feel free to view the video and work along if you like! I hope you all have a wonderful day, and if you haven’t already joined us over at the YarnWars Group, I sure hope you’ll consider! There are so many fun people to hang out with and share your love for your yarning craft, pick up free patterns, share your fabulous creations and join in on a contest here and there! Also, if you haven’t already, please consider registering here at YarnWars.com. 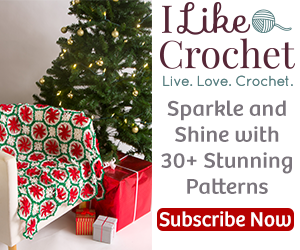 You will learn of new free patterns that are coming out, contest announcements, and these fun little crochet fashion tips and more, delivered straight to your inbox!